A wearable battery-powered robotic arm that can be used to boost a user’s weight-lifting strength by upto 18kg is the winner of this year’s James Dyson award, an annual prize established by the prominent industrialist’s charitable trust, The James Dyson foundation. Developed by a team of four mechanical engineering students from the university of Pennsylvania in the US, the Titan arm was invented to help reduce the risk of back and arm injuries in people like warehouse workers, who have to repeatedly lift heavy items. Its developers claim that it could also be used to help stroke and injury victims rebuild muscle and relearn fine motor control, and even enable people with permanent disabilities to regain independence. 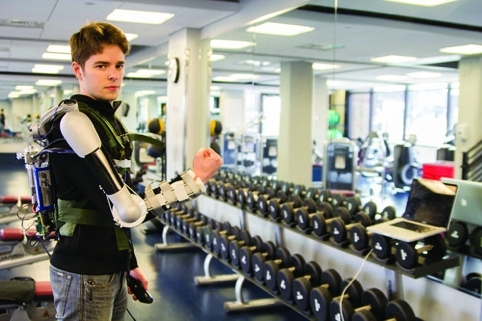 The system, which has been designed to be a fraction of the cost of existing powered exoskeletons also provides detailed quantitative feedback to doctors which can be used to motivate their patients by tracking improvement over time. It looks like a great idea, but how do they prevent the wrist/hand being injured as this looks unsupported from the photo? Re-designed backward as an electricity generator coupled to a dynanmoter http://blog.setra.com/test-and-measurement-dynamometer/2013/02/06 would sure make for a different scene at the gym each morning. If developed and accepted on a mass scale I question to whether we need a nucelar power station as the primary power source! How many people waste energy exercising! Put exercise to a constructive use – More power to your elbow – Had to be eh! I sincerely congratulate these students on their initiative: and hope that the teaching they received from their lecturers/tutors went some way to support their efforts. Hopefully First Class Honours degrees will be awarded! Is it too much to hope that this type of product development will be extended to encourage ‘local’ design and manufacture of the multitude of ‘domestic’ (as opposed to Government/State) pieces of Engineering currently ‘imported’ by the US and UK retailers. Presently benefiting other economies, not ours! How soon to manufacture? As a parent of adult twin sons with a progressive neuro muscular disorder that seriously affects the arms this offers immediate short term assistance and hope…. Huge congratulations to these students, their mentors and Dyson for their award scheme. The first step in overcoming a major barrier has hopefully been won. Future development of the type they hope to see, open source, can only bring hope to the millions in desperate need of devices such as this but cannot afford the prices current market led equipment demand. Once momentum is under way I hope development of other exo-skeleton body parts also begin.